My fantastic assistant, Emily Buchanan, is taking over the blog today with a guest post about her Parisian neighborhood in the l8th arrondissement. 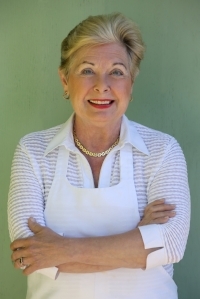 Follow her here for the latest on dependable restaurants, wine shops, bakeries, and more! Over the past five years or so, the outer boroughs of Paris have become hubs for gastronomic renewal. Lower rents and young restaurant-loving locals make the outer arrondissements, particularly in the north of Paris, favored locations for young chefs and restaurateurs to set up shop and make a name for themselves. Of course, not all the outer neighborhoods guarantee fine croissants, good coffee and satisfying bistro dining, but when one does spring to life and the old mingles with the new it’s always exciting to watch. Just north of the Caulaincourt metro, away from the throngs of tourists on nostalgic Amelie tours and wandering the steep cobbled streets in search of the Sacré Coeur, is a quiet, very residential neighborhood, fast making a name for itself as a culinary hotspot of the 18th. How do I know this? Because it’s my neighborhood. When I moved here four years ago, there was scarcely a decent bistro to speak of. Now, I can barely keep up with the new openings all over the neighborhood, from new ethical grocers, to hip, modern bistros. If you find yourself hungry in Montmartre, skip the terraced cafés on rue des Abbesses and head north of Caulaincourt for a more authentic bite of the local Paris dining scene. Here are my favorites, old and new. After only five months, this small 14-seat bistro has hit its stride, serving a simple but flavorful menu. Dishes change daily but you can expect such elegant dishes as an entrée of zucchini gaspacho adorned with thin slices of haddock, or an original take on a salmon tartare with preserved lemons, showered in salty salicorne (sea greens). Or for main course a falling-off-the bone, succulent, slow-cooked lamb from the Limousin, served with a butternut squash puree. It has a certain zeitgeist feel – modernist décor, open kitchen, bar and a menu that only gives a list of ingredients. But the food is honest, and the service genuine and friendly. An excellent addition to the neighborhood. 21 rue Montcalm | +33 1 42 58 71 35 | Open Monday to Saturday. Closed Monday dinner and all day Sunday | À la carte 30-35€. A neighborhood institution, Au Bon Coin is a welcoming place to refuel at just about anytime of day: for a quick morning coffee at the bar (this is no craft coffee, just straight up French espresso with no frills), or for a more leisurely beer or glass of wine later in the day. The menu remains staunchly classic – good but not spectacular. The sautéed pommes de terre, however, are completely addictive. 49 rue des Cloÿs | +33 1 46 06 91 36 | Monday to Saturday 8am to midnight (lunch daily, dinner Monday to Thursday). This shoebox of a restaurant is run by a super-friendly Franco-Venezuelan couple, Joss and Victoria. The mainstay of the menu is traditional Venuezuelan areperas, baked and fried cornmeal pockets with freshly made fillings, like chicken, avocado, black beans, cheese and baked plantains. A recent favorite lunch menu entrée was a deep flavorsome beef broth with cubes of white sweet potato, and spiced up with some coriander and hot chili sauces. This new coffee bar (by the owners of Bululu, above) brews one of the best coffees you’ll find in this part of the Montmartre neighborhood, using Belleville Brulerie roasted beans. On hot days their iced coffee is hard to beat, but as the weather gets cooler it's a toss up between the guayoyo (filter coffee) or their perfectly executed cappuccino. Another new bistro addition, the bustling, convivial Esquisse (meaning 'sketch') serves up classic bistro dishes with a modern twist. I loved their hearty reinvention of a caillette (round, pâté-like pork sausage mixed with vegetables and wrapped in caul fat) using veal, a lighter, more contemporary version of its traditional Provençal counterpart. 151bis rue Marcadet | +33 1 53 41 63 04 | Open Tuesday to Saturday. Closed Sunday and Monday | À la carte 30-40€. At Le Ruisseau you can find a fine burger: a seriously respectable classic cheese and bacon, or go for the more unusual goat cheese burger made with Saint-Maure de Touraine, caramelized onions, honey, mustard and baby spinach. The ubiquitous hamburger joints across Paris aren’t all good, but this one is a keeper. 65 rue du Ruisseau | +33 1 42 23 31 23 | Open Monday dinner-Sunday. Closed Monday lunch | Burgers 12 – 14€ (served with home made fries or salad). The breakfast pastries in this unassuming-looking bakery are buttery yet light and perfectly flaky. And try the tasty rustic pain aux cereals, mixed grain loaf. 145 rue Marcadet | +33 1 42 58 75 74 | Open Monday, Tuesday, Thursday-Saturday 7:30am-8:30pm, Sunday 8am-8pm. Closed Wednesday. The dessert pastries in the window will have you pressing your nose up to the glass and reconsidering your latest diet. Their tourte auvergate, a dense nutty rye loaf, is worth a detour, but I give mixed reviews to their viennoiseries (breakfast pastries). 57 rue Damrémont | +33 1 42 64 59 63 | Open Tuesday to Saturday 7am-8:30pm, Sunday 7am-8pm. Closed Monday. Calabrian chef/owner Salvatore Rototori was voted the best pizzaiolo (pizza thrower) in Paris by French food guide Le Fooding last year and they are not wrong. Using the freshest ingredients direct from his home region in the south of Italy, everything is good here – try the Garabaldi with buffalo mozzarella, arugula, cherry tomatoes and spicy Calabrian cured meat capicollo or La Salina white pizza with broccoli rabe (cime di rapa), buffalo ricotta and marinated anchovies and transport yourself to Italia. Simply one of the finest cheese shops in Paris – and one of just a handful that ages their cheese in their own cellar beneath the shop (cheese tours and cheese tastings are available in English and French). It's always a difficult decision given the vast choice of excellent cheese here, however you can't go wrong with one of their raw milk goat cheeses such as the thyme-infused baguette du thym. If you’re a cheese lover, don’t miss this gorgeously displayed and extremely well stocked shop. They also carry superior quality milk, Bordier butter, and various condiments to accompany cheese. 54 rue Damrémont | +33 1 46 06 76 54 | Open Tuesday-Saturday 9:30am-1pm, and 4pm-8pm, Sunday 10am-1pm. Closed Monday. If natural wines are your thing, or you are curious to learn more, owner Alban Le Cam knows the story behind every bottle and has an extensive selection of natural, biodynamic and organic wines, mostly from small French producers, all at modest prices. A recent summer discovery is the bold yet refreshing Côte-du-Rhone white, Vigne du Prieuré blanc 2014 from Château Gigognan, a southern Rhône white blend of Roussanne, Marsanne and Clairette. 154 rue Ordener | +33 9 81 44 10 16 | Open Monday 5-7pm, Tuesday to Thursday 10:30am-1:30pm and 4:30-9pm, Friday 4:30-9pm, Saturday 10am-9pm. Closed Sunday. I am addicted to this newly opened organic fruit and vegetable shop, mostly for its fabulous heirloom tomatoes that taste like they have been grown in the earth and sunshine, as tomatoes should. I love the fact that they have a section of produce that does not carry an organic label but has been minimally sprayed, so there’s a price point to suit all budgets. For some California sunshine in Paris, try this breezy hillside café that serves up excellent Coutume-roasted coffee, granola, breakfast muffins and healthy daily-changing lunch menus. 33 rue Lamarck | +33 1 71 37 99 95 | Open Tuesday to Friday 9am-5pm, Saturday and Sunday 10am-6pm. Closed Monday and most public holidays. One of the prettiest, and most delicious pastry shops in the 18th, if not the whole of Paris. Recently reviewed here. This has been, in my view, the best restaurant in the 18th for many years. Previously, the room was a little pokey but every dish was perfectly conceived, using the freshest of ingredients, and the prices were truly affordable. A recent interior décor makeover helped it get its first Michelin star this past March. Prices have gone up a bit, particularly in the evening but the Tuesday through Saturday lunch menu still remains very reasonable, and worth every penny. 18 rue Eugène Sue | +33 1 42 55 61 64 | Open Tuesday to Saturday. Closed Sunday and Monday | lunch menu 31 – 38€, dinner dégustation menu 79 – 99€ (120 – 160€ with wine pairings). Meaning ‘the extension’, La Rallonge is the wine bar annex of La Table d’Eugene. Some favorites from the Table d’Eugene menu have migrated next door to join the wine bar offerings, including the much loved ‘risotto’ de coquillettes (tiny pasta shells with cèpe mushrooms and truffles). You almost can’t go wrong in this wine shop, who specializes in rare wines and supplies wines for La Table d’Eugene’s extensive and well-selected list. Vintages from Eric and Joël Durand and La Domaine de la Janasse have become go-to favorites. 31 rue Simart | +33 1 42 23 99 11 | Open Monday 3-8:30pm, Tuesday to Friday 10am-1:30pm and 3-8:30pm, Saturday 10am-8:30pm. Closed Sunday and Monday morning. 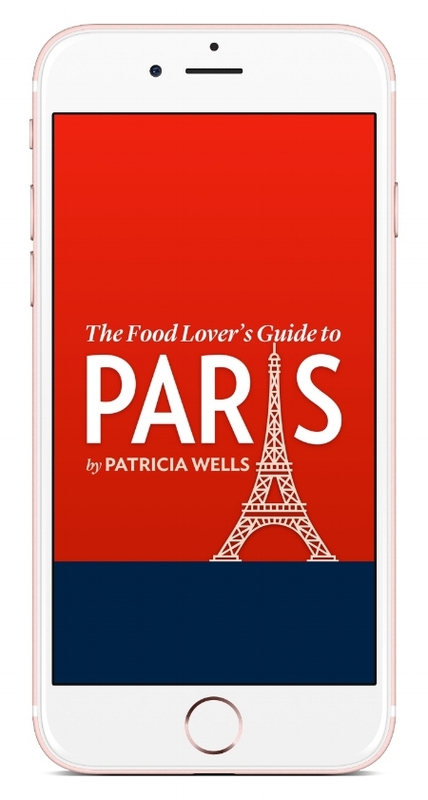 For the complete reviews of some of these addresses and for other recommendations of where to eat in Paris, get The Food Lover's Guide to Paris 5th edition book or the App for the iPhone (also works on the iPad). All photos © Emily Buchanan. Braden Perkins the immensely creative chef behind Palais Royal restaurant Verjus, and the adjacent Verjus wine bar, is going for a third win with his latest tapas-style endeavor, Ellsworth (a tribute to Perkins’s Grandfather). Perkins has installed 22 year old Canadian Hannah Kowalenko as head chef, who adds a brand of inventiveness beyond her years to Perkins’s already impressive repertoire. The evening menu, which offers nearly a dozen substantive little tastes, a cheese selection and two desserts to choose from, is perfect for a quick snack or a multi-course feast, depending upon one’s appetite of the moment. The food is generally full of bright, vibrant flavors, well-seasoned (although at times a little heavy handed with the salt), and cleverly conceived, with no theme that screams “you’ve seen this all before too many times.” Most dishes are priced at 10 to 13€, each copious enough for two to share. The long, narrow dining room, with plenty of bright window space, is sober but not cold, with light wooden floors, crisp white walls, 1930s style bistro chairs, antique brass wall sconces, and slate grey banquettes. The small white marble tables, white linen napkins (thank you! ), and beautifully engraved Ellsworth wine glasses give the place a touch of class, freshness, and modernity. As if Kowalenko had been given a list of my personal preferences, I happily discovered the seasonal menu (which changes regularly according to market offerings) replete with some of my current favorite ingredients and dishes: seasonal corn, green beans, pork meatballs, deep-fried clams and grilled squid. Each dish has a personal signature and when a dish sings it does so loud and clear. 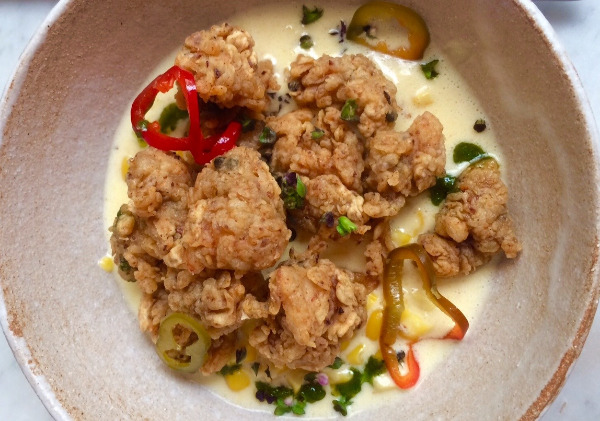 My favorites were the fried clams (palourdes) set on a bed of fresh corn kernels bathed in a light creamed corn soup, a touch of basil, and a few slices of marinated baby peppers. The clams were heavily breaded and fried to a perfect golden crunch, with the sweet corn serving as fresh, lively foil. I loved, as well, the fresh green beans and pencil-thin baby carrots that were seriously wok-style sautéed over high heat, giving them a smoky, meaty personality. She is clever with flavor pairings and pays close attention to how texture plays in a dish. Here the smoky vegetables were set against a bed of mild creamy houmous, a touch of sesame, and covered with a shower of deliciously crunchy bread crumbs, a combination that awakened one’s palate and could almost have been a meal in itself. The least interesting dish of the meal was the homemade mozzarella, thin as lasagna, wrapped like Vietnamese rice paper around a very good blend of tiny cubes of sautéed tomatoes and zucchini, seasoned with herbs and capers. While the filling was truly satisfying, the mozzarella itself lacked flavor and substance, and left me wondering why bother making such things in-house when the results are so underwhelming. The dish’s visual appeal cannot be denied though. The baby squid was decisively seared to a smoky high and was set on a bed of timidly seasoned riced potatoes and leeks – good but I would have preferred a bolder pairing. One of my favorite dishes of the meal – the beautifully seasoned and well-seared pork meatballs – were sadly marred by an unforgivably harsh harissa. Desserts were winners, with a very moist and intense walnut cake topped with a colorful, generous, full-flavored blend of seasonal fruits – cubed peaches, nectarines, blueberries and giant blackberries just slightly warm – finished with dulche de leche, a dollop of cream and bits of crunchy, crumbled walnuts (photo below). The pairing of malt ice cream and chocolate sorbet was brilliant and quite irresistible, even after the marathon sampling of little plates. I’ll go back for sure, as this meal rates among the most inspired I have had in many months, and I am keen to follow the culinary adventures of both Perkins and Kowalenko through the seasons. At lunch time there is a set, fixed price menu, with a trio of choices at each course. The wine list offers a good selection of sips by the glass, and service is swift and pleasant. For more Paris restaurant reviews, get The Food Lover's Guide to Paris 5th edition or download the app. This has been a rough year for our vegetable garden, and while my heirloom tomatoes usually supply enough for an army, right now they are struggling to produce their usual bounty. Meagre as the offerings may be, the tomatoes that are growing have tons of flavor. Some favorite varieties — such as kaki coing, black prince, noire de crimée, and striped germain — offer intense pleasure. At every meal, I slice up a rainbow selection, shower them with a touch of fleur de sel, homemade lemon vinaigrette, and tiny leaves of basil from my amazing basil “trees” in the courtyard. This simple platter is a favorite way to enjoy a tomato's fresh juicy sweetness. Here I have topped the tomato slices with ruffles of the firm Swiss cheese Tête de Moine, shaved with a special machine called a girolle, but any cheese of choice can be used here. 6 servings | Equipment: A cheese girolle, a mandolin or a very sharp knife; a large serving platter. About 1 1/4 cups (310 ml) Equipment: A small jar with a lid. Note: A cheese girolle can be found in my amazon store, . If you do not have a girolle, cut the cheese into paper-thin slices with a mandoline or a very sharp knife. For many foreigners dining in France, the French language can often be a frustrating and intimidating barrier to truly enjoying a meal out. A simple mistake in translating a menu can mean disappointment when an unexpected dish arrives. The subtle nuances of the French language don't make this any easier either. It's easy to confuse tourteau (crab) with tortue (turtle), ail (garlic) with aile (poultry wing) or chevreau (young goat) with chevreuil (venison) . When I wrote the first edition of The Food Lover's Guide to Paris and France back in the 1980s, I knew a thorough glossary of culinary terms would be an essential component of the guides. It was painstakingly compiled from hours of research (this was pre-internet days of course!) and translations of menus that were sent to me from the restaurants I was reviewing. 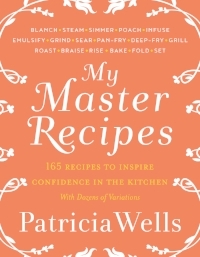 The result includes translated names of ingredients, regional cooking styles and dishes, meat cuts, cheeses, fish names, and cooking techniques, and is still as relevant today as the time I first wrote it. I have continued to update it with modern culinary terms that are often found on menus in France, for the glossary section of The Food Lover's Guide to Paris app for the iPhone – a handy pocket reference when dining out, no internet connection necessary. And for those of you without iOS devices, I have now made it available here, on my website. Enjoy! Summers for me are almost exclusively a Provençal affair. With temperatures soaring into the 80s and 90s, I bunker down in the cool stone kitchen of my hilltop farmhouse in Vaison-la-Romaine, to test recipes, cook from my bountiful summer vegetable garden and prepare for my late summer cooking classes. So for those of you travelling to Paris this summer looking for gastronomic inspiration, I leave you in the capable hands of my good friend and co-conspirator on the fifth edition of The Food Lover’s Guide to Paris, Emily Buchanan. If the original Belle Époque exterior of this immaculate Montmartre patisserie (a classified historical monument, built in 1900) is not enough to draw you in, then the rows of Boris Lumé’s signature finger-shaped tarts, glistening in the glass vitrine, surely will. The pastries here have as much charm as the décor, with its off-white and duck-shell blue wall tiles, butterfly-themed tile frieze, and original heavenly ceiling fitted out with a crystal chandelier – this is what dreams of Parisian pastry shops are made of. 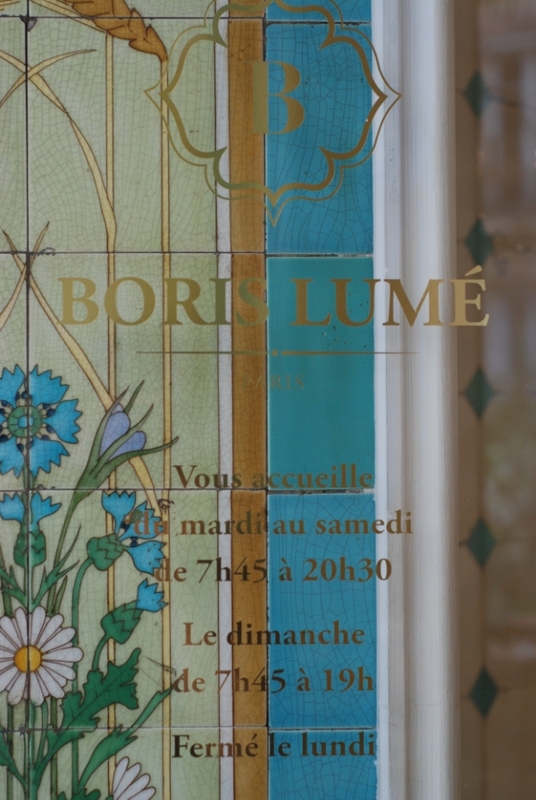 Pastry chef, baker and owner Boris Lumé opened his first shop with his Japanese wife Mihona (also a baker) on the leafy rue Caulaincourt in the 18th arrondissement in 2013, after time spent under the tutelage of the likes of Joël Robuchon in Tokyo, and Cyril Lignac and Meilleur Ouvrier de France Frederic Lalos (of Le Quartier du Pain) in Paris. His selection of tarts and viennoiseries (breakfast pastries) is small, but finely tuned – each creation a small work of art, but without pretension. His tarte citron doesn't have many rivals with its irresistibly crisp base, thick pillowy lemon cream that has just the right balance of acidity, sweetness and creaminess, hiding a thin layer of soft cake-like hazelnut biscuit. Among the lineup is an excellent version of the classic Paris-Brest, a light choux casing filled with praline cream and punctuated with a crispy praline crunch. Other offerings include tarts with seasonal fruit toppings such as strawberry or fig, and a less traditional matcha and black sesame tart with red fruits, a nod to Mihona’s Japanese origins. I love their homely tartelettes, soft pastry casings filled with dark acidic cherries (griottes) and an earthy pistachio cream. 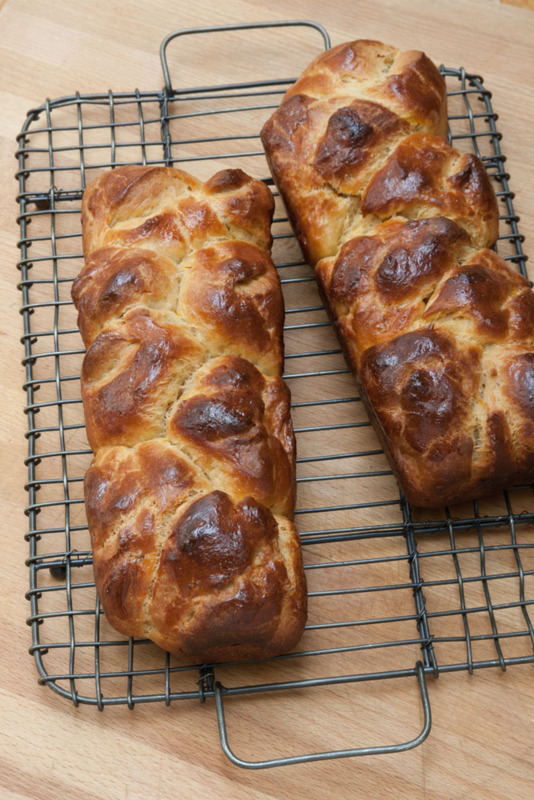 The viennoiseries are without fault: buttery, light and perfectly flaky. The baguette tradition has a flavorful crumb, although I prefer my baguette a little more bien cuite – well baked – with a crunchier crust. I’d rather go for their near-perfect, nutty pain d’épeautre (spelt loaf), and I can hardly pass by this shop without grabbing a loaf. 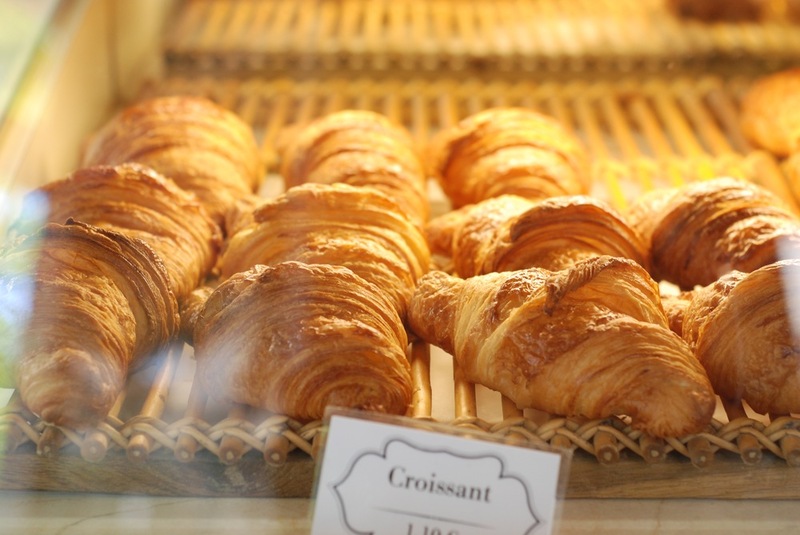 If you’ve been searching for the perfect Parisian pastry shop, you may well have just found it. For more Paris restaurant reviews, get The Food Lover's Guide to Paris 5th edition book or iPhone app. 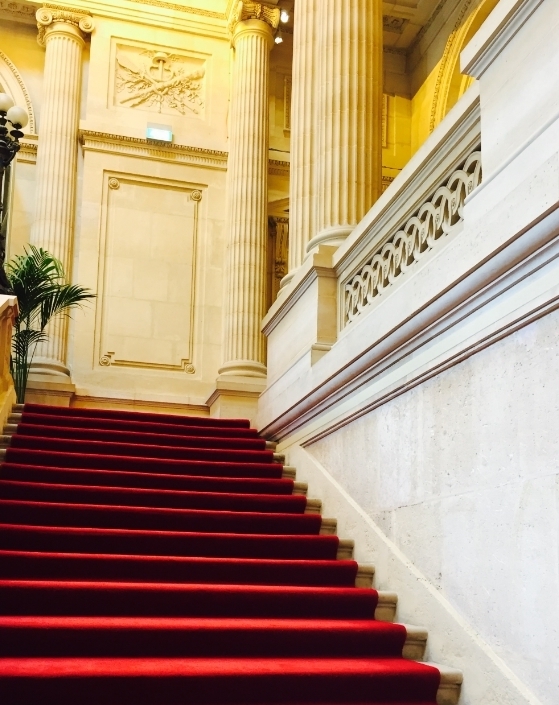 The red carpet is out for Guy Savoy all over the city of Paris. With his new restaurant celebrating an official opening Tuesday, May 19th, this three-star chef and his almost giddy staff are luxuriating in their new sunlit home inside the 6th arrondissement Hotel de Monnaie de Paris along the Seine. With no less than five dining rooms boasting huge windows, the restaurant overlooks tall shimmering chestnut trees, the Seine, out onto the Louvre, Pont Neuf, the Île de la Cite. and beyond. For Savoy, 62, the adventure and the dream began in 2009, when he visited the oldest institution and oldest factory in France, the French mint. He bid, and won a chance to move his 17th- arrondissement restaurant on rue Troyon to the mint. Construction proceeded more slowly than anticipated, since asbestos was found in the structure and needed to be eliminated. Today, the restaurant sits on the top floor, with spacious kitchens just below, sporting welcoming windows with the same bright view as Savoy’s diners. One enters the august, newly renovated space walking regally up the red-carpeted stairs decorated with medallions and laurel wreaths. Dining rooms are warm and cozy, in colors of brown and anthracite with touches of modern lighting, all fully respectful of a building founded in 1864 and rebuilt in the 20th century. Two “soft-landing” preview lunches in the new dining rooms attest that Savoy’s food remains on the same steady course he has followed since first opening in Paris in 1977, achieving his third Michelin star in 2002. Guests will find many of his signature dishes, such as the landmark soupe d’artichaut à la truffe noir et brioche feuilletée aux champignons et truffes (a masterpiece that marries earth with earth, the earthy flavors of artichokes and the wild mushroom essence of the truffle, embellished with an unforgettable mushroom brioche brushed with fragrant truffle butter). His famed huîtres en nage glacée never fails to excite or delight, nudging the briny, iodine-rich essence of oyster to new heights as a mildly creamy oyster puree lines the oyster shell as the real deal sits atop it like a king. A spoonful of jelly created with the oyster liquid tops it all for a celebratory hit of oyster heaven. Savoy constantly works to capture the essence of an ingredient and bring it to your palate: His pea soup, made with peeled peas (!) and a puree of that regal vegetable, topped with a soft-cooked quail egg, blends on the palate with intensity and clean, welcoming, spring flavors. And there are new dishes --- such as salmon “cooked” on dry ice at the table – with the fresh, brilliant strips of salmon embellished by an avalanche of varied citrus, including lemon, lime, and the rare Australian caviar citron, sporting little, citrus-flavored beads that look just like the caviar of our dreams. Savoy’s masterful pastry chef, Christian Boudard, has outdone himself with spring desserts: In one, rhubarb is sliced paper-thin and dried to bring out its brilliant flavors, molded in the shape of onion skin, which serves as a perfect vessel for his vibrant rhubarb sorbet. He works the same idea with this season’s strawberries, a fine sorbet, paper-thin slices of strawberries, dried to bring us its very soul. Do not forget Sylvain Nicolas, Savoy’s sommelier, a man I trust with my wine life! He has never steered me wrong, visit after visit. Discoveries at a recent lunch include Josmeyer’s Grand Cru Brand Riesling, 2009, a wine that is at once authoritative, regal, lively, and pure. As well, Domaine Rebourgeon-Mure’s pinot noir Pommard 1er Cru Clos des Arvelets moved everyone at the table, emerging with a purity of fruit, finesse, and expression of delightful ripe tannins. The Hotel de la Monnaie restaurant is not his only project for the moment. In December he opened L’Huîtrade on rue Troyon, a compact oyster bar offering some of the world’s finest oysters and oyster dishes; the former Restaurant Guy Savoy on Rue Troyon will become a fish restaurant, d’Etoie sur Mer in June of this year; and already famous for his brioche, Savoy will open a brioche boutique, Goût de Brioche, at 54 rue Mazarine, Paris 6, in June. GUY SAVOY | Monnaie de Paris | 11 quai de Conti | Paris 6 | Tel: +33 1 44 80 40 61 | Métro: Pont Neuf | Open Tuesday to Saturday, closed Saturday lunch, Sunday, and Monday | www.guysavoy.com | reserve@guysavoy.com | Lunch and dinner: 360€ menu, à la carte €200, not including beverages | Reservations suggested.